My New Year’s Resolution is to give my patio a makeover. What should I do? A patio makeover is a fantastic New Year's Resolution! The patio should be a wonderful place where coffee, books, burgers, playtime and relaxation are enjoyed by the entire family. If your patio isn't a place where friends and family create new memories and strengthen bonds, then it’s high time for a makeover. The first thing to consider is the addition of a patio fireplace or fire pit. This decision will turn your patio into the house hot spot (both figuratively and literally). Along those same lines, consider a more robust grilling environment with the addition of a built-in barbecue grill or even an outdoor kitchen. Two words: warmth and food! Yes, when people are warm and cozy with full stomachs, they are happy. But now consider some entertainment. Especially when OSU football season gets underway, the Eastern Sky phones light up with requests to mount TVs on a patio, porch, or deck. And, since the outdoors can be harsh in Central Ohio, fluctuating from hot and humid summers to cold and damp winters, this can be a challenge. When you combine the impact of the elements with things like dust and pollen, placing sensitive electronics outside is a challenge. 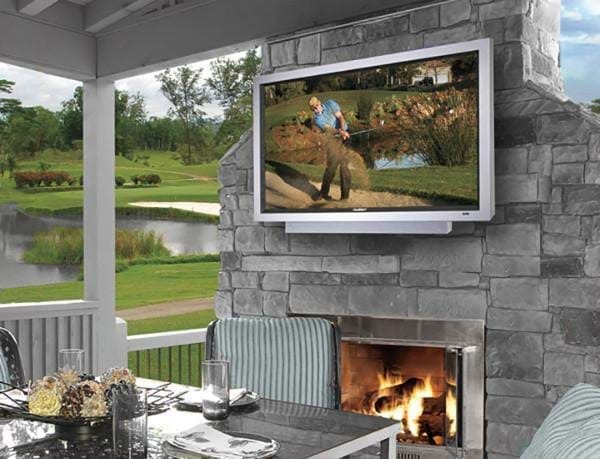 However, Eastern Sky can help you with entertainment systems that are designed for outdoors, including water resistance and the ability to handle extreme conditions. Some of these systems are even extra bright to compete with the sun, and they have excellent sound. So, now we have three words: warmth, food and entertainment! Finally, sometimes you must go big or go home: it may be time to upgrade the patio surface. Replace the concrete with pavers. This will result in a transformation that not only increases the value of your Central Ohio home, but also increases your happiness with your own backyard. Of course, there are many other makeover considerations. For instance, consider outdoor lighting. Just adding string lights to your patio really improves the atmosphere, but Eastern Sky can install more permanent lighting options to really turn your patio into something special. And don’t forget about decorating your patio. Try adding new cushions to your patio furniture to update its look. If that doesn’t work, maybe it’s time to get some new outdoor furniture. No matter how you decide to improve your patio, the most important thing is to just get it done. Let us help! Call Eastern Sky to do your Central Ohio patio makeover. Happy New Year!